Although drones have been in use for many years for military and intelligence gathering applications, over the last year commercial use of them has skyrocketed to the point where the Federal Aviation Administration has mandated their registration. It is estimated that seven million drones will be shipped by the end of the year 2020, and that the projected value of the drone industry will approach $90 billion by 2025. Even though there are concerns among consumers related to theft and privacy, a high number, 47 percent, are interested in drone deliveries, to highlight one key application. Beyond deliveries, drones are being used for photography, surveying, real estate and infrastructure surveillance and inspection, security, and agriculture monitoring. Wireless communication is used in drones for two main purposes: 1) to remotely control the drone flight and convey flight control commands from the user to the drone and 2) to convey information from the drone to the user—information such as first person view (FPV) video or flight information: altitude, speed, location, and battery life. Depending on the amount and type of data to be transmitted, low latency and a high-speed connection can be required. Typically, drone connectivity is provided by proprietary wireless technologies or, in some cases, public Wi-Fi operating in unlicensed spectrum. However for some of the more sophisticated applications being developed now that have high data usage and long-range flight requirements, or where the user and drone are not within line-of-sight of each other, the range and capability of typical wireless connectivity technologies is not sufficient. Licensed LTE cellular networks, which provide almost global coverage and a uniform quality of service, are needed. 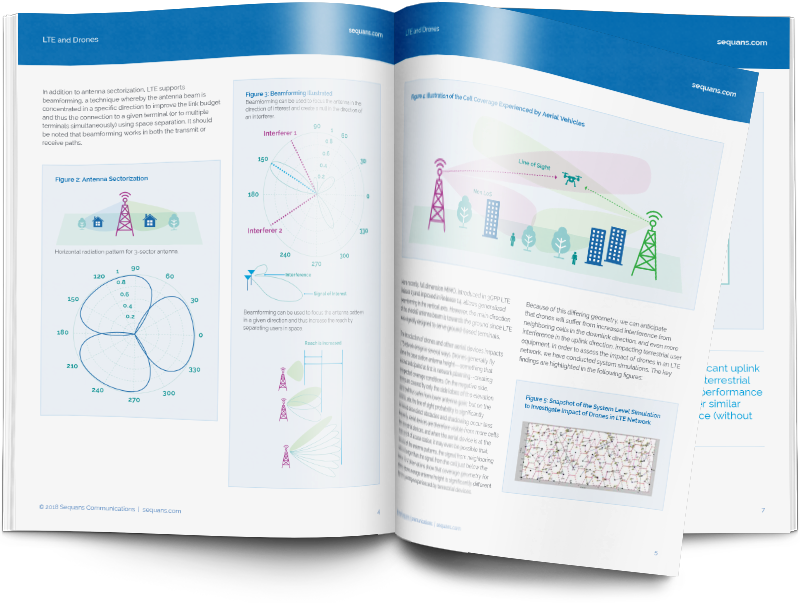 Connecting flying objects has been discussed in documents describing the uses and evolution of LTE networks, both in 4G and in the future 5G. Moreover, a dedicated report entitled: Study On Enhanced Support for Aerial Vehicles, was approved by the 3GPP1 in March of 2017 within the context of 3GPP LTE Release 15 to identify possible issues and improvements needed in LTE to support drones and other flying devices. Sequans, as an expert in LTE technology and a provider of optimized LTE connectivity solutions for many types of devices, including inflight devices, has devoted time and resources to investigating the use of LTE for drones to get a better understanding of the performance of drones in terrestrial networks, and the impact of drones on network performance. This white paper summarizes the key findings.